We received two winter jackets from our friends at Canada Pooch, and these awesome jackets came in handy when we brought Bear and Momo to Cypress Mountain to play in some snow! The jackets kept the pups warm and also helped prevent snowballs from forming all over their fur. Bear is wearing the Everest Explorer Vest in size 28. These come in 3 colours (army green, red, and black) - we chose the army green for Bear. The jacket is water-resistant with a soft fleece lining. The hood is removable, and there are 4 pockets for treats and poop bag storage. The Everest Explorer Vest is one of the Canada Pooch products that come in Bear’s humongous size (size 28). Look how happy/proud he looks wearing this vest! Momo is wearing the Alaskan Army Parka in size 18. These come in 3 colours as well (grey, green, maroon) - we chose grey for Momo. The parka has a water-resistant canvas shell with sherpa lining. We love the brass trims and details on this jacket, it gives a super high-end feel. There are 2 pockets for treats and poop bag storage. Near the bottom of the parka, there is an adjustable toggle that ensures a better fit. A big thank you to our friends from Canada Pooch for gifting Bear and Momo these fabulous jackets! 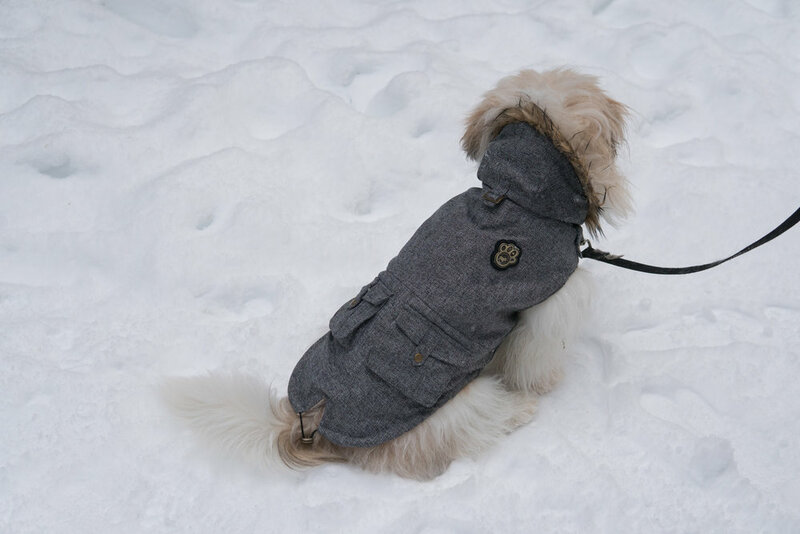 The jackets are super stylish and functional, and they fit the pups so well! It is difficult finding dog clothes that fit our 70lbs super-fluffy Bear, so thank you for making apparel for the big fluffballs!